Cylinder inserts are the most common mechanic closing devices. Cylinder insert was found by Joseph Bramah in 1784. Principle of operation is based on blocking rotate the drum by pegs, simultaneous elevation of each for proper height by a key causes the ability to rotate the drum and movement of trigger lock. If we use wrong key, one or several pegs continues to block the drum and prevents his rotation. 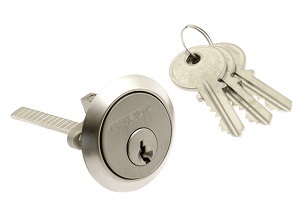 universal, cylinder inserts for surface locks, RIM - available in many, but not to all kins of surface locks - they allow the exchange of inserts, also keys without the need to change corpus of lock. For proper selection of the insert you must decide on the type used insert and on her dimensions. Inserts need to be properly seated in the door, the dimensions need to be selected, the insert can not stick out the shield door more than 3 mm (oherwise beside unaesthetic look we enable possibly of breaking her during burglary). Inserts can be closed by a key-slit or recently more and more common drilled key. To improve the aesthetics keys of some varieties / manufacturers inserts have heads doused by a plastic. Inserts possess in set depending on the type insert 3-5 keys. Inserts for which the distance A is equal to the distance B we called symmetrical, the rest, where A<>B we call asymmetric. 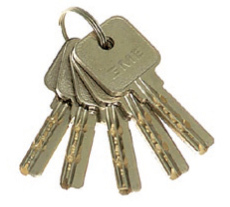 Inserts can make systems that several inserst may be open by a one key, another keys opens only a single insert. Those systems we called Master Key. 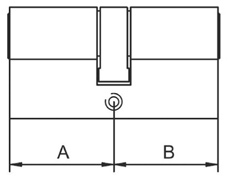 Cross Dimensions of cylinder inserts are standardized, which means that every insert should match witch every mortise locks. The only criterion of insert selection is her length. Instert schould be very carefully matched with door and plate thickness. Often we need to buy unusual inserts, mostly longer, used in inside doors, garage doors and other. 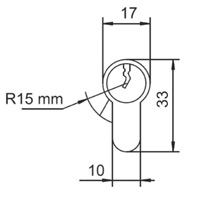 We have a wide range of dimensional cylinder inserts, symmetrical and asymmetrical directly available in our store - you must specify dimension A and B and optionally location of the knob. 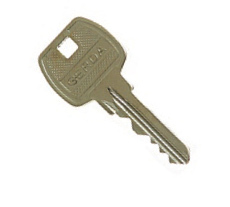 The inserts are different, also the amount of keys available with insert these are often 3 or 4 keys, but sometimes there are inserts with 5 keys in set. Another feature is the finishing of the insert corpus, mostly brass inserts (copper-gold color, depending on the manufacturer of gloss or dull), nickel (silver with gloss) or satin (silver matt). The characteristics of the cylinders is determined 9 digit code contained mostly on the packaging in accordance with European standard PN-EN 1303:2007. This code contains the full details of the insert and determines such features as: the category of use, durability, weight doors, fire resistance, safety, corrosion resistance and temperature is the security key, resistance to attack and with reference to the "old" standards of Polish resistance to burglary. The most important feature of the cylinders is their safety class defined fields from position 7 (determine the security of the key) and position 8 (describing the security of insert - its resistance) - see table at the bottom of the page. 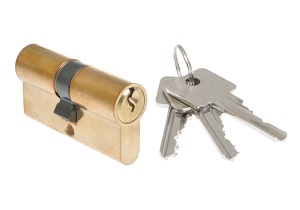 A class - inserts ensure the safety of of the principle of the mechanism, without additional security. These inserts can be used anywhere, where we do not require increased security. B class - inserts of this class are characterized by increased stability and may be equipped with an additional mechanisms for impeding burglary. They should be used in public buildings where we do not require an increased level of safety. C class – Cetrified inserts. The inserts in this class have additional anti-theft protection including hardened pins, security ring before pulling out and twisting of inserts, insert locking security in the case of an intrusion attempt, coding card that prevents unauthorized key-making, unique key profile and more. 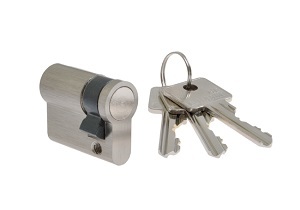 Level, the number and efficacy of security depends on the manufacturer and specific types of inserts, usually for more money buying more security.